We design, install and deploy a managed WiFi network that provides complete coverage of your site. Utilising the latest equipment from a variety of leading vendors, we have a range of hardware and management platforms for every park, regardless of size, location complexity or number of visitors. Your customers can make payment securely via Paypal or Credit Card using our online portal. Direct to Caravan offers the most efficient and cost-effective solution for reliable high-speed broadband. This is achieved by locating a receiver on the exterior of the Caravan which then connects to a compact router situated inside. Don't worry, we specialise in delivering high speed networks to rural locations, so it’s very rare we can’t find a solution for you. 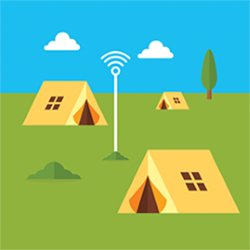 Using our expertise in wireless networking and working with a range of suppliers we can provide both hotspot and Direct to Caravan Broadband to caravan sites our competitors can't. In some cases it will be completely free of charge to have Superfast WiFi installed on your caravan park. We will install, manage, run and support the network adding value to your site without any additional overhead or workload. We can also install a system working via revenue share. HUBBNET will still install, manage and support the network but the profits are split between ourselves and the caravan park. If you would like to own the entire system then that is fine too. Please get in touch and discuss your requirements by clicking here.